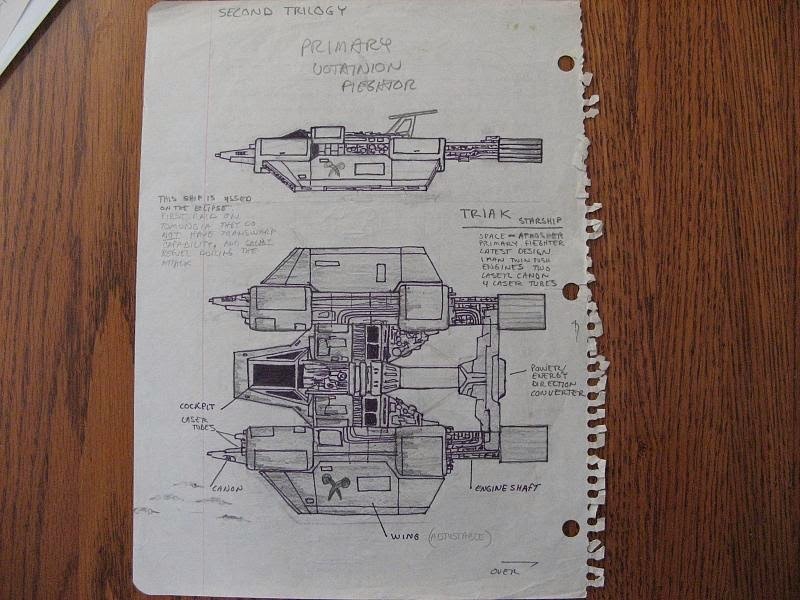 This Votainion starfighter has it’s roots back in the early 1980’s when it was known as the Triak. 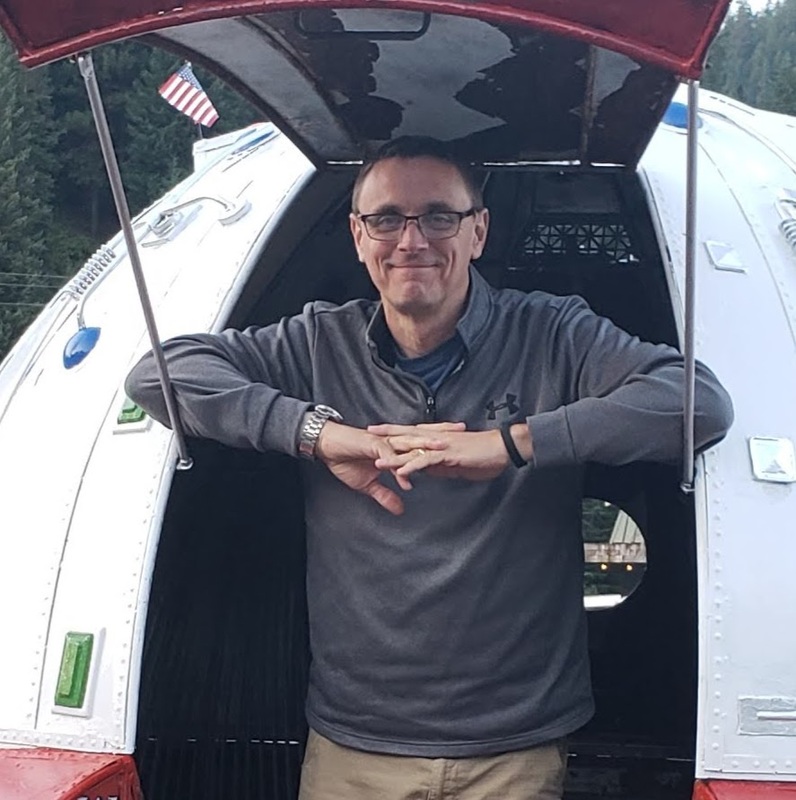 I think “Tri” referred to the middle energy thing coming out the back of the fuselage. I thought about doing that with this model but then quickly scratched it. Some of the things I liked about this fighter were the jagged lines of the fuselage and the wings. Both were retained and the twin engine design which was reproduced pretty faithfully. I started the build with the engines. 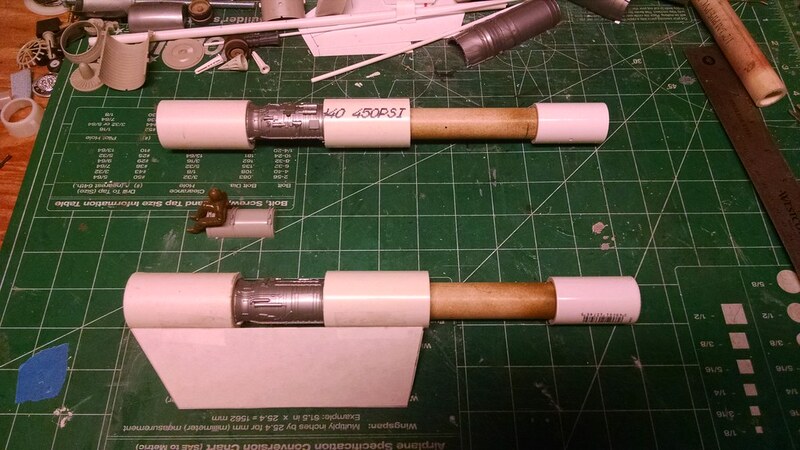 Painted green and white from over spray on other builds are 1/2″ PVC pipes run through one inch pipe. 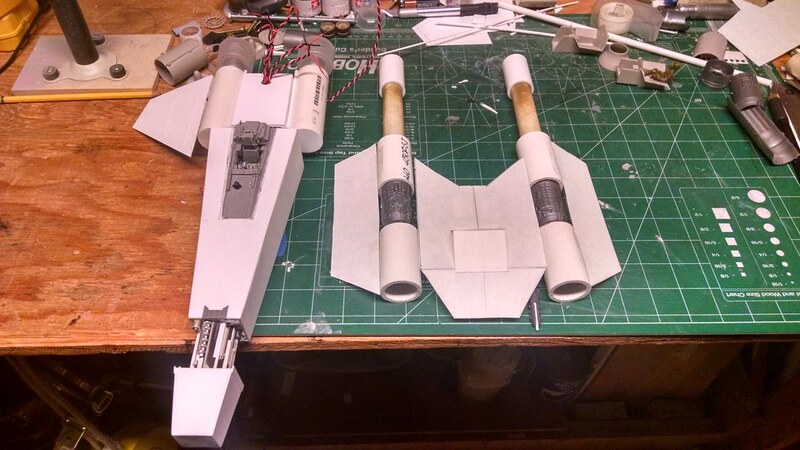 I used the engine of a 1/32 scale F-104 Starfighter jet for the gap between the one inch pipes. On the ends of the engines I put some PVC connectors for the exhausts. 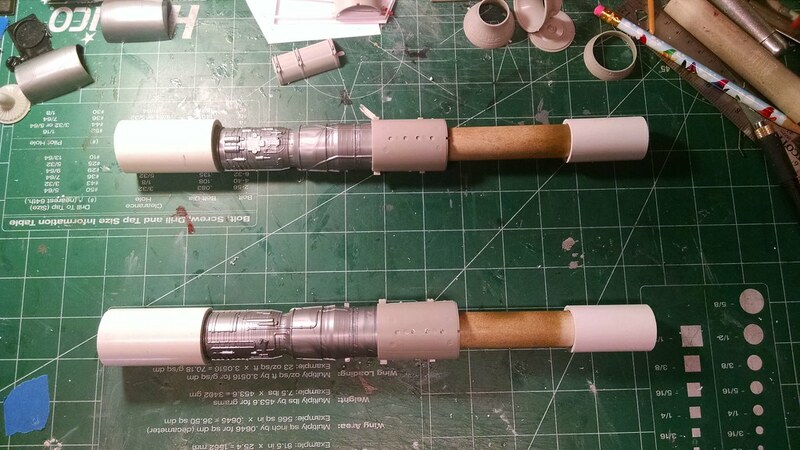 Below you see I decided to cut the F-104 engine in half and stick to the one inch PVC for the covered parts of the engines. 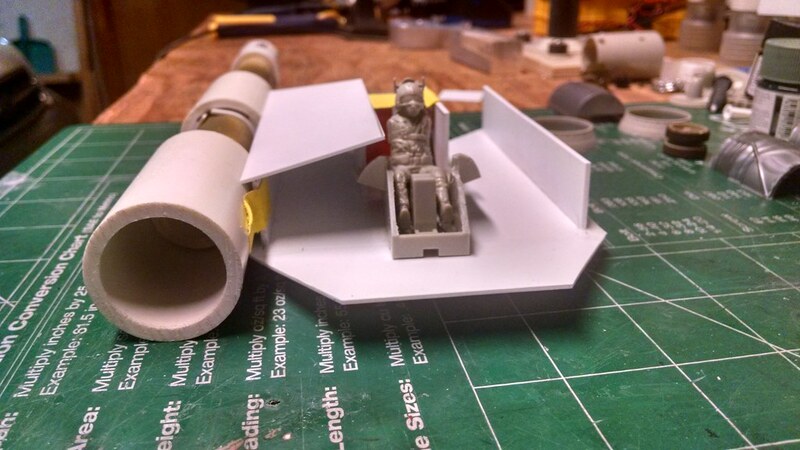 You can also see the beginnings of the cockpit, starting with an old get pilot sitting on a gas tank. Heh. I also have a paper cut out of the wing for scale. 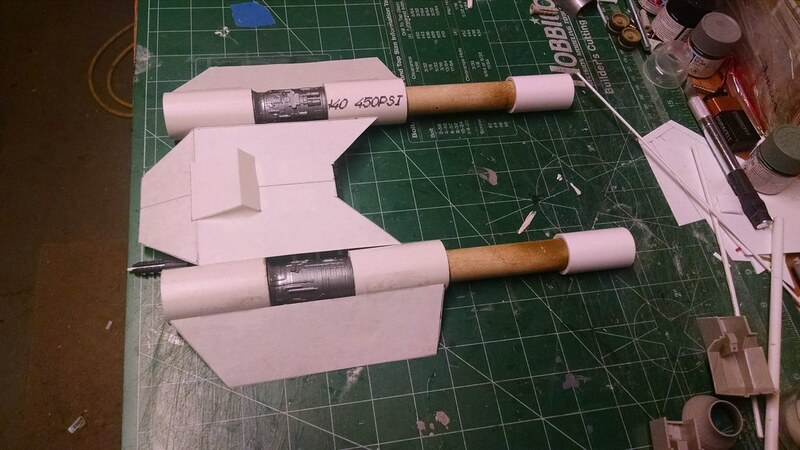 Below I used more paper to flesh out the cockpit, fuselage and a gun idea. 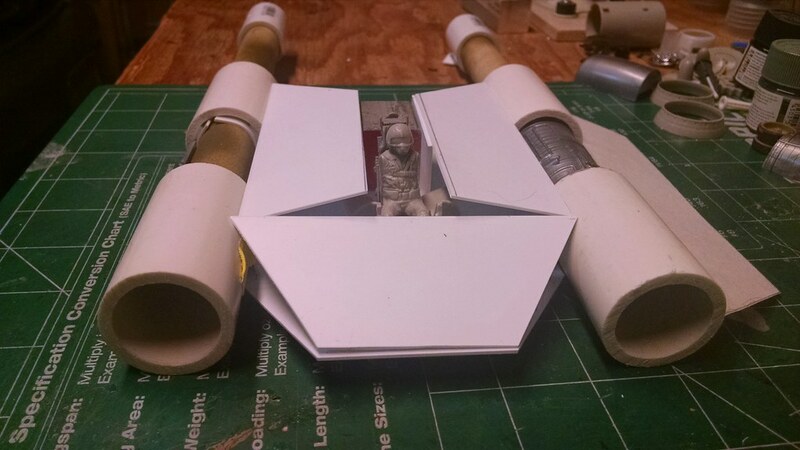 The cockpit is closer to what I had originally drawn. It’s been reborn for the K’nat fighter. Here we have the two primary starfighters for the middle trilogy of the Star Saga. The Alliance Spieron on the left and the Terrox on the right. These are the Swift and KIV-3 for the middle of the war. Man the Spieron’s nose is huge. Like, Klinger large. After cutting up some plastic and positioning the cockpit I start building the mounting bracket for the aluminum block used for the mount. I wrapped plastic around the 1/2 inch tube to center it inside the one inch tube. You can see it sticking out in the image below. The cockpit is from a Tamiya F-14 Tomcat 1/32 scale. Here I use camera tape to hold together the plastic so I can see the angles I’m dealing with. They are quite unique. But that’s what I like about this model, it is all kinds of unique and different. It also has some call backs to familiar starfighters from Hollywood. 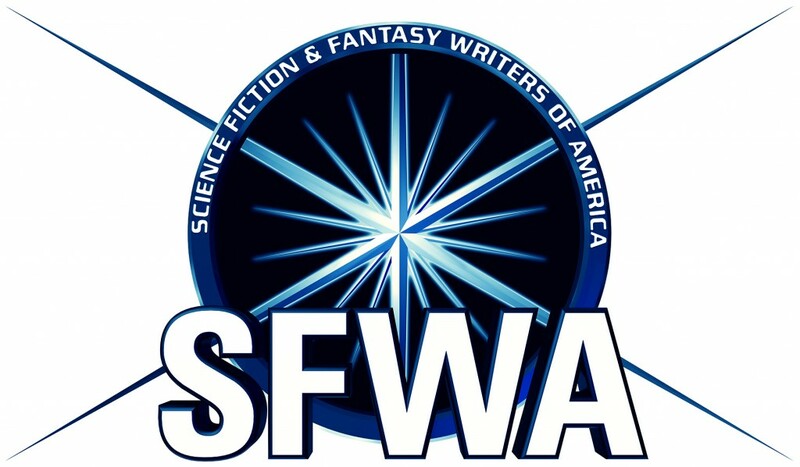 Such as the Y-Wing from Star Wars and the Cylon Interceptor from the original Battlestar Galactica. Here’s a look at the tail end. I still haven’t taken glue to it yet, but you can start to see the final shape a bit clearer. Here’s a close up of the cockpit details. 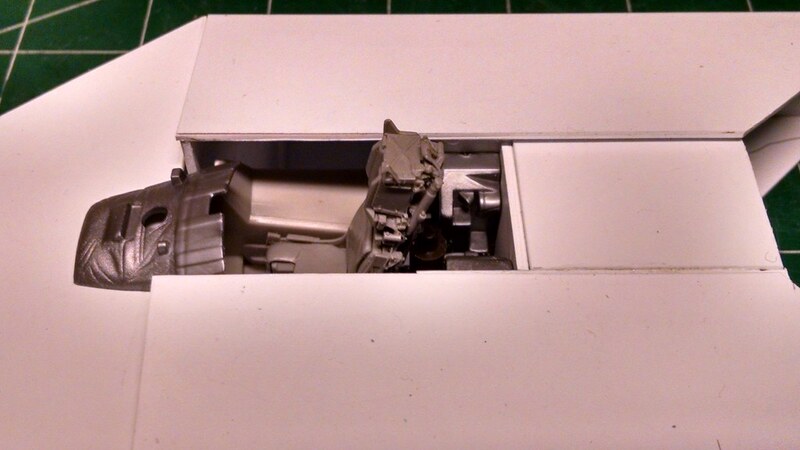 I used a third party ejection seat from an F-4 Phantom in 1/32 scale. 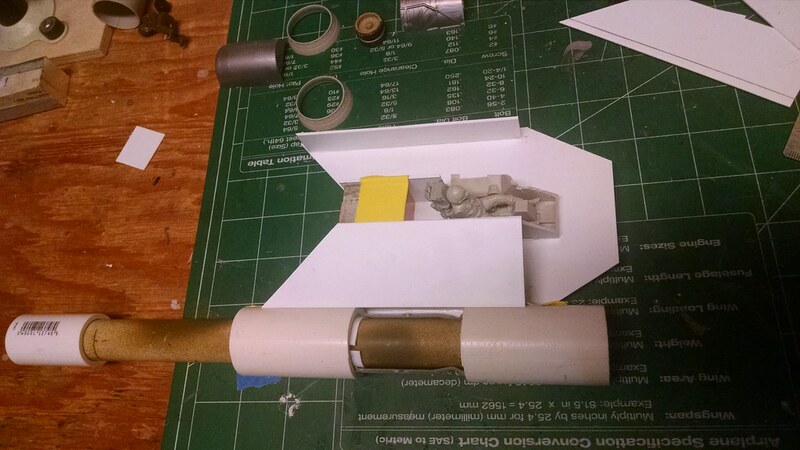 The top piece there is from the F-104 kit. 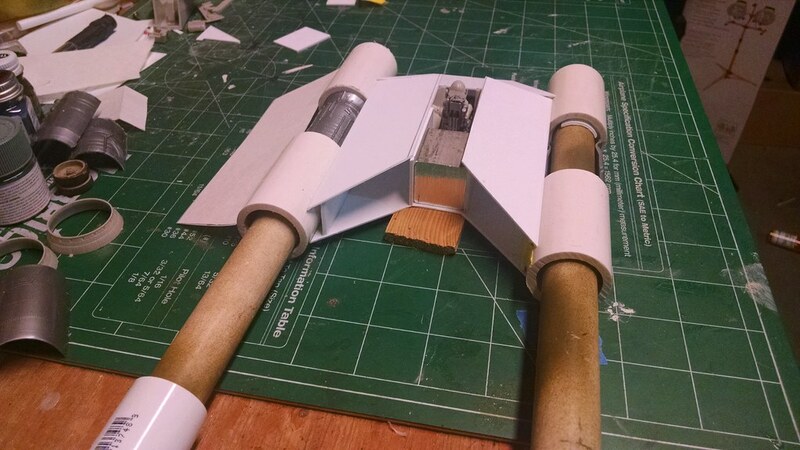 Next up we’ll start gluing things down and moving forward on the details.